I have actually already received this sample. 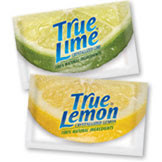 True Lemon is a Lemon substitute that can be used in recipes or even in your tea or water to sweeten it. It also came with a coupon that doesn't have an expiration date! Go here to get your free sample.